Pictured is the terminus of Merrick Boulevard on the city of Delaware’s northwest side. 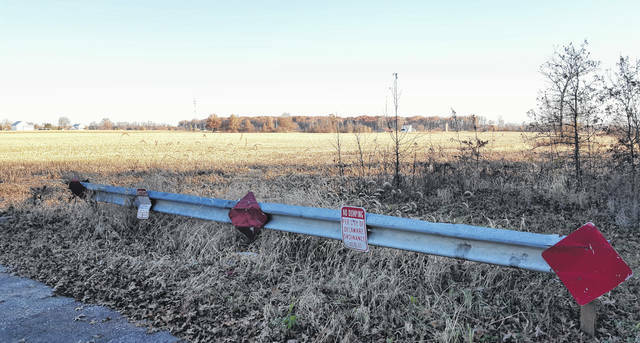 The farmland in the background could become home to a new subdivision in the future pending City Council’s approval of a request by the property owner to downzoning the 44.258-acre parcel located on the west side of Troy Road across from Smith Park. If the land is developed, Merrick Boulevard stands to be extended to Troy Road. During Monday’s Delaware City Council meeting, a second reading and public hearing of an ordinance seeking to downzone 44.258 acres of land on Troy Road from R-4 Medium Density Residential District and R-6 Multi-Family Residential District to R-3 One-Family Residential District was met with some resistance from nearby residents. Recommended to council for passage by the Delaware Planning Commission, the downzoning request involves primarily flat farmland (small section of wooded area included) on the west side of Troy Road across from Smith Park and north of the Westfield Hills subdivision. Zoning Administrator Lance Schultz said roughly 40 of the 45 acres in question is zoned R-6, which if developed, could yield up to 285 apartment units, while the remaining five acres zoned R-4 could yield approximately 29 single-family lots for a total of 315 housing units. Michael Shade, attorney for the trust, confirmed that is the case and said his client initially looked into the possibility of using the current zoning to build apartments or condos, but research revealed it would be impossible to “make the numbers work” from a financial standpoint. After the second reading of the proposed rezoning amendment, council member George Hellinger noted if the ordinance is passed following a third reading, it could clear the way for the extension of Merrick Boulevard from its current terminus at Cambridge Road in the Westfield Hills subdivision to Troy Road. Schultz has previously stated that if the land were to be developed into a subdivision, the developer would be responsible for constructing the roadway extension, which has been on the city’s radar for quite sometime as a way to divert traffic away from busier areas like West Central Avenue and give first responders a quicker path to access residences in the northwest quadrant. Residents Cindi Blair, Jonathan Barnett, and Sarah Dinovo, all of whom live near the 44-plus acres of undeveloped land on Troy Road, addressed council with their concerns, not with the possible change in the zoning district, but with talks about the extension of Merrick Boulevard if the land were to be developed into a subdivision. Barnett echoed similar concerns and said drivers are cutting through his neighborhood (Ablemarle Circle/Cambridge Road) in order to bypass Houk Road. City Manager R. Thomas Homan thanked the residents for voicing their concerns at the public hearing. “We understand. We were aware that there were some concerns raised, and it’s understandable,” he said. However, Homan added, for every instance one raises regarding traffic issues in the northwest part of the city, he can provide instances involving the Delaware Fire Department where the proposed extension of Merrick Boulevard would cut EMS runs in half by getting to Troy Road quicker, which provides a direct route to Grady Memorial Hospital. “That’s the balance you have to weigh,” he said.